From the moment a visitor comes to Chrissi island, he magnetized by the exotic natural landscape dominated by cedar, the golden sand and the light aquamarine water.The Natural images and the rhythms of nature, immediately give the visitor a newfound sense of liberation. The island has a small bar on the north side of the island, a small tavern on the south side, an Orthodox church of St. Nicholas, a lighthouse on the northwest side, and a house on the northeast side. There are three recognized permanent residents on the island until now. For six months a year - from mid-May until late October there are timetables with small boats, departing from the ports of Ierapetra and Makrigialos, to the island on a daily basis. After an hour's trip around, the vessels approaching the southern side of the island, which is usually calmer. The exit is in the "Vougiou Eye" where there is a small pier, reception, and the tavern. 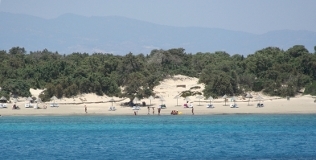 Chrissi island is protected by Natura 2000 Networking Programme, as an "area of intense natural beauty", and also has been designated as a wildlife refuge. The island hosts the largest naturally formed Lebanon cedar forest in Europe. The majority of trees have an average age of 200 years and average height of up to 7 metres, some of the trees are up to 300 years old and 10 metres tall. The density is approximately 28 trees per hectare. The contact with such a natural and unique environment, creates environmental awareness, but also requires respect for its natural functions. About 700m east of Chrissi island is Mikronisi, a rocky islet which covers 11,7 hectares. The waters around the islands are shallow. Up to 1km to the north and 500m to the south the depth does not exceed 10m, while the 5m depth contour encompasses both the islands.